Lean Cuisine Honestly Good Review. Does it Taste Good? me a complimentary coupon to get the free Lean Cuisine from my local Kroger grocery store. This cuisine is much healthier than the regular Lean Cuisines because there is no artificial ingredients, it's minimally processed, and no preservatives. It comes in 6 yummy flavors to choose from like Pomegranate Chicken, Lemongrass Salmon, Roasted Red Pepper Chicken, Plum-Ginger Grain-Crusted Fish, Pineapple Black Pepper Beef, and Honey Citrus Chicken. It took me two different Krogers to find these cuisines but I should've read the coupon carefully because they are located in the organic frozen foods section. 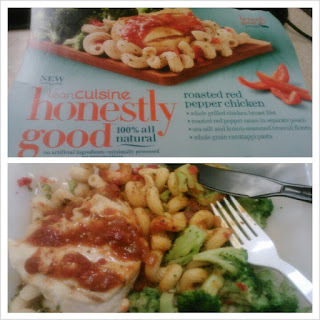 The entrée I decided to try out was the Roasted Red Pepper Chicken because I love red sauce on my foods. It takes about 4 minutes to warm it up in the microwave and the food comes out fresh. The food tasted homemade like if it was freshly prepared. Only thing I wish is that it came with more food in the dish, I did find myself somewhat still hungry. Inside the entrée, it comes with whole grilled chicken breast filet, roasted red pepper sauce, sea salt and lemon-seasoned broccoli florets, and whole grain cavatappi pasta. My meal was quite tasty and I love the fact that it only has 270 calories in it. The sodium is a bit high though, 520 mg.
Is Lean Cuisine Honestly Good Worth a Try? I like this cuisine and can honestly say it taste much better than the regular Lean Cuisine and much healthier. Due to the sodium being a bit high, I won't eat it as much but it's worth trying it out and seeing what you think of it.